• Easily expands tube for braze or soldered joints in seconds. • Floating jaw head design is self-centering for fast, accurate alignment. • Re-rounds deformed tube ends. 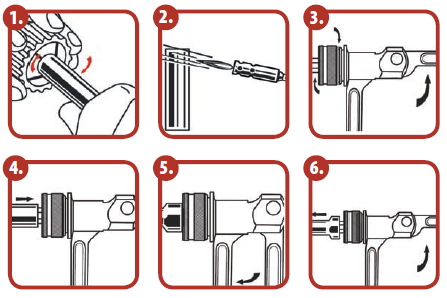 • Accurate joints in seconds without using fittings. • For soft copper and soft thin wall steel and stainless steel tubing. • Save 60-70% of time over conventional swaging tools. 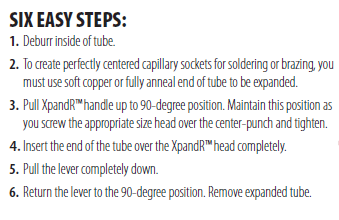 • Reduces soldering by 50% over standard fittings.• Meets ARI tube insertion recommendations. • Long life with high alloy hardened steel jaw segments. • XpandR™ Tool comes with non-slip, ergonomically designed grips. 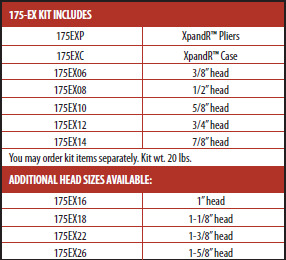 • Includes 5 heads: 3/8”, 1/2”, 5/8”, 3/4” and 7/8”. • Includes metal tool case.